Custom kennels - right from the manufacturer! Gator Kennels is one of the leading dog kennel manufacturers - producing the most stylish custom kennels in the United States! We build all of our kennels to order to ensure that each animal has the proper amount of space and all of its needs are met. 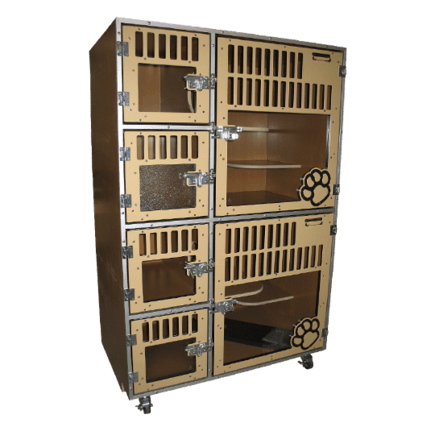 Whether you are a veterinarian, dog groomer, animal shelter, dog or cat breeder, boarding facility, or dog daycare; we can build the commercial dog kennel or cat cage system tailored to your needs! From the small family-owned facilties to the large commercial franchises, Gator Kennels has a solution for companies of all sizes! Purchase your dog kennels, cat cages, and kennel supplies directly from the manufacturer for the best quality and customer service. Specifically designed for cats; Gator Kennels Cat-hotels come pre-assembled with an upstairs and downstairs living space. Each section is further divided into a litter-space, sleeping-area, and a play-area! Each unit is constructed from our durable PVC plastic for best comfort and easy cleaning. 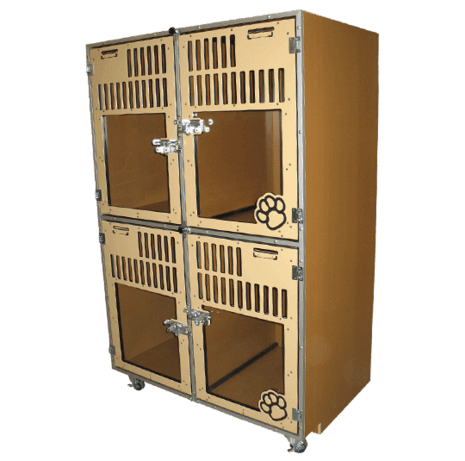 Meets the USDA standards for long-term feline boarding, these kennels are perfect for Animal Rescues, Veterinarians, Boarders and Breeders! This is one of Gator Kennels more versatile kennel systems. Designed with a living-space upstairs and another downstairs, the double-stack can house two medium/small dogs at a time. Or - install the removable divide panel and each space is further divided for a maximum of 4 spaces for small dogs! Great for Groomers and dog boarding facilities, the removable divide does not require tools to switch out - allowing you to customize on the fly. Each unit is constructed from our durable PVC plastic for best comfort and easy cleaning. If you are looking for large kennel spaces, Gator Kennels Signature Series has you covered. This system of kennel utilizes aluminum Posts that support ½-inch thick HDPE plastic side panels for amazing versatility! Standard sizes available - or mix and match standard panels to create your own sizes. Panels can also be cut down for custom-widths - allowing you to truly match any space! 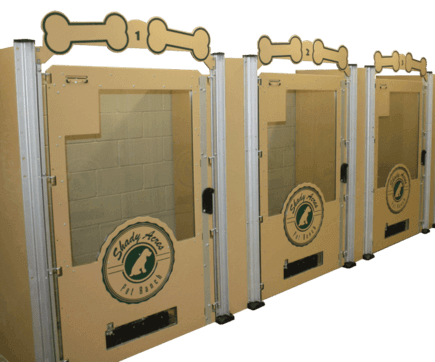 Save some money by sharing side or back panels and save even more by attaching the kennels to your existing walls! The possibilities are endless. Available in a variety of colors to match your theme. Your facility might already have concrete, block, or built-in kennels - but you want new gates to help spruce-up your facility. Gator Kennels can help with that too! The gates are constructed from rugged ½" thick HDPE Plastic for a durable gate that looks more inviting. The gates will attach to your existing kennels using an aluminum angle-bracket that you attach to your walls. Like the Signature Series Kennels, our Kennel Gates can be customized with the features you want along with some color and design options! Dogs will be dogs... and sometimes things wear out. Accessories for your kennel facility. Read it now - or print and save it for later!